Out of the many challenging tasks that an HR department of an organization performs on a daily basis, writing rejection letters to the applicants top the list. While drafting such letters, one need to use the appropriate selection of words and use a polite tone of writing for the conveying the message in a respectful as well as a sensitive manner to the hopeful candidate. Rejection letters are also essential for your organization as you will have to reject multiple application at a time. 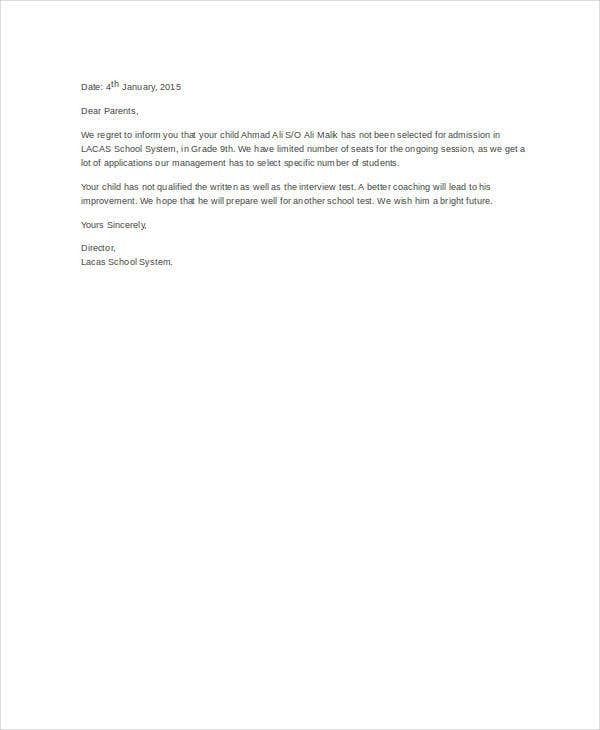 Here is a list of such Rejection Letter Sample templates that will enable you to write sophisticated rejection letters. 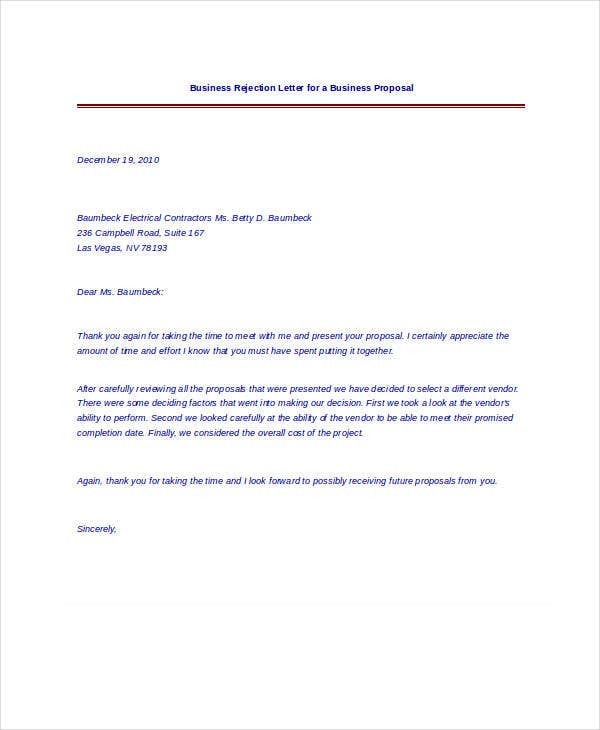 Sample Rejection Letter After Interview is a well-formatted rejection letter template using which a company can convey the message of rejection to the applicants. 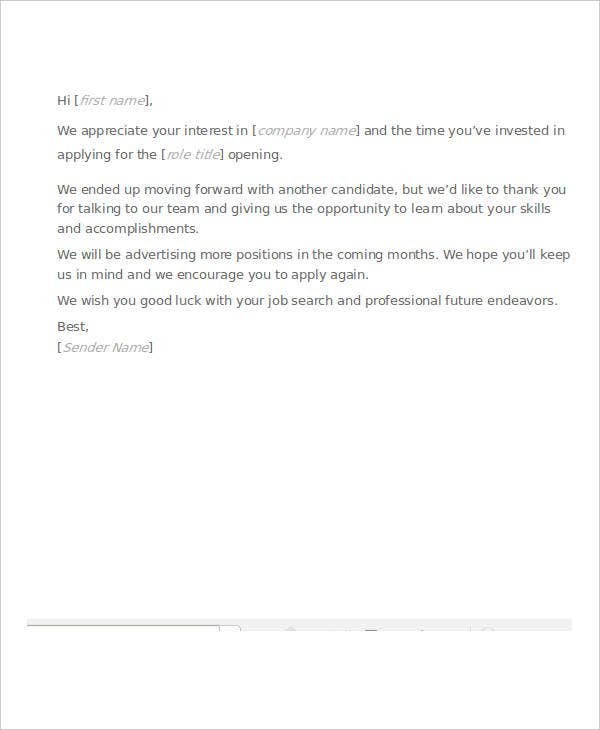 Separate paragraphs have been used, and the company has even wished the candidate luck for his/her future endeavors. You can also check the Employee Resignation Letter Template. 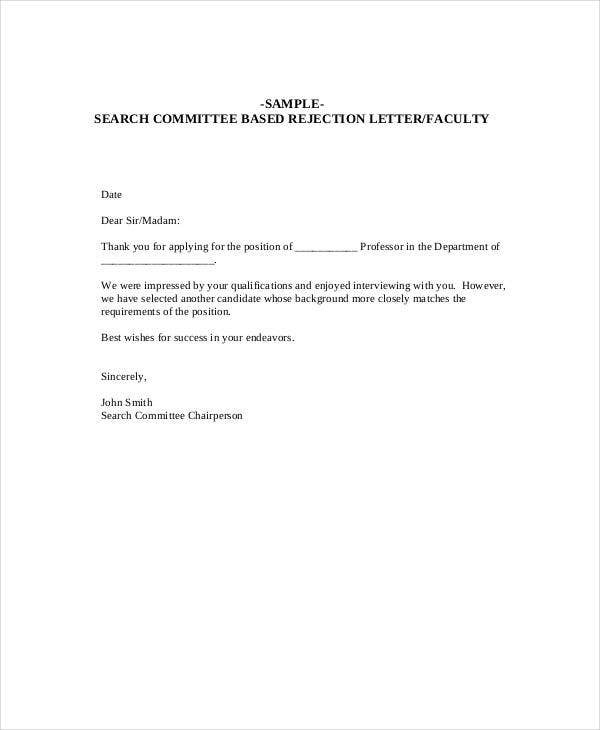 Candidate Rejection Letter Sample is brief and to the point rejection letter template that can be used to convey the message to the applicant why he/she wasn’t selected. This letter ends on a positive note when the employer inform the applicant that they will soon post job openings and he/she may apply again. 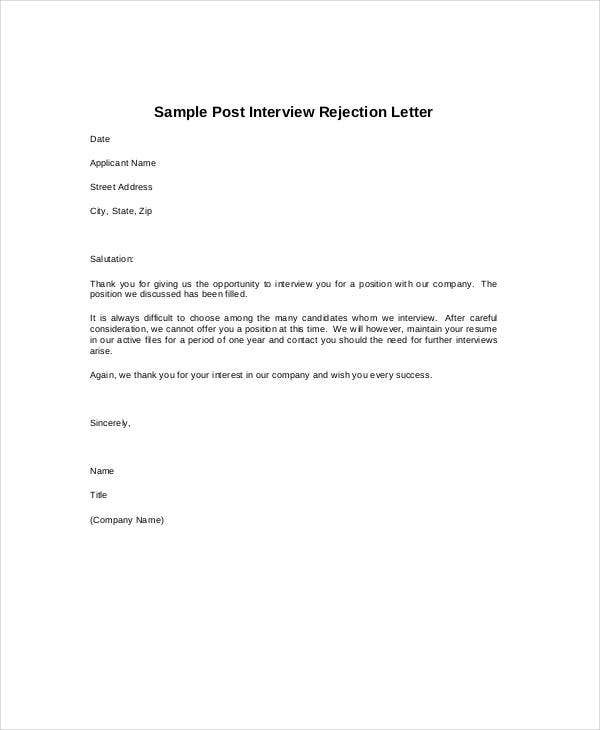 Post Interview Rejection Letter Sample is rejection letter that has been crafted using polite words so as not to hurt the sentiment of the applicant. The candidate was informed that it was difficult for them to choose an appropriate candidate among so many and they couldn’t select him for the job position this time. But they may call him/her in future if they have openings. > Why do you need to use these Rejection Letter Samples? We all know how difficult it is to say no and when it comes to saying no to an applicant who has rested his/her hopes on the job, it’s even more challenging. But when a potential candidate doesn’t meet the standards needed for the job, you will have to say no as a hiring manager it is of utmost importance for you that you hire the right talents. In such a complicates situation, our Rejection Letter Samples will come very handy as they will help you in conveying the message to the applicant stating that he/she doesn’t qualify for the applied job position. Scholarship Rejection Letter Sample is a rejection letter written with carefully chosen words. 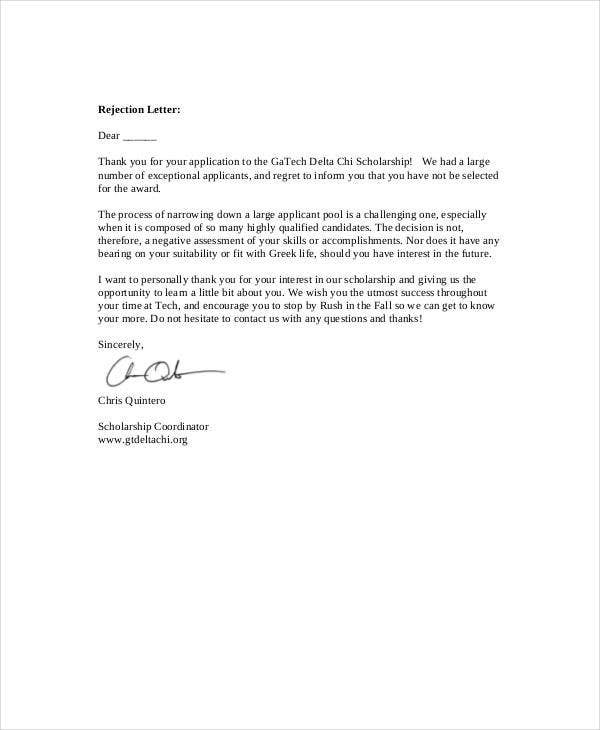 The applicant was thanked for showing interest in the scholarship in an appropriate manner and if you are in such a position and looking for a rejection letter, use this template. 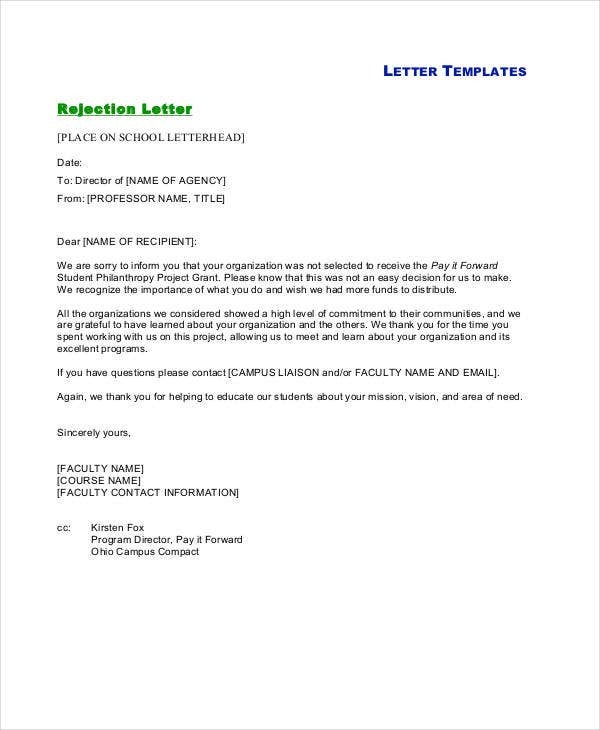 Application Rejection Letter Sample can be utilized by those who need to convey the message of rejection of residency to the applicants. Polite tone and kind words have been used, and the applicant is provided a list of reasons why he/she wasn’t selected. > What are the benefits of using these Rejection Letter Samples? One this is for sure, and all human resource department would agree to this, writing a rejection letter is never an easy task. It is not because they feel sad to deny an applicant a probable job opportunity, it is because it is not always easy to write a rejection letter to each and every candidate who has been rejected. Thus this template will be immensely beneficial in making your task easier. 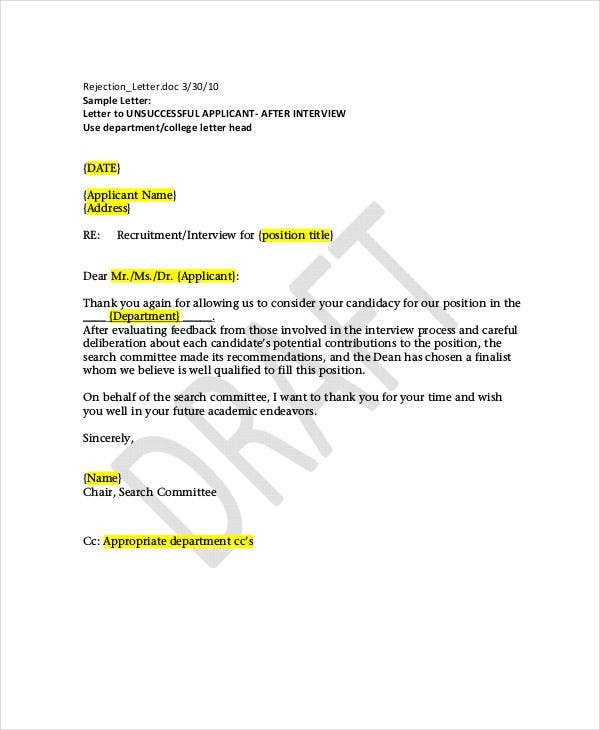 All these templates are tailor made to suit your different reason for which the candidate might have been rejected. You can also check the Job Rejection Letter Templates. As we all know, customizing an existing letter template is a lot easier than drafting a new one from scratch. And we have a vast collection of Rejection Letter templates to choose from. 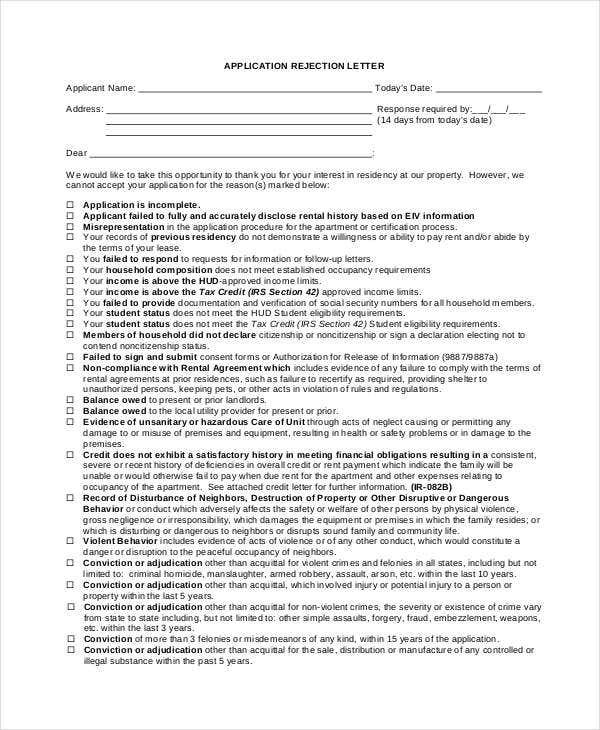 Once you have decided on the template, all you need to do is, download the template, customize the content, take print out and send it to the concerned applicants.